Designed to support fully decked Studio and OB cameras equipped with long box lenses, 7 inch viewfinder or large teleprompter. The Magnum is an extremely compact fluid head incorporating a patented counterbalance system as well as an advanced fluid damping module. Manufactured with an extensive use of ultra-strong aircraft aluminium , the Magnum provides for outstandingly precise movements and consistently high drag output. The unique patented counterbalance system is ideally suited to operate with cameras featuring a high centre of gravity and weighing from 40 to 95 Kg. Cameras within this range can be perfectly balanced through the entire 130° tilt angle. Calibrated with a variable adjustment connected to a digital readout display, the counterbalance operating knob is conveniently located on the side of the head. The frictionless fluid damping modules also feature a patented design which provides for extraordinary performances over an extended temperature range, with smooth and precise movements together with a linear response in any critical environment. 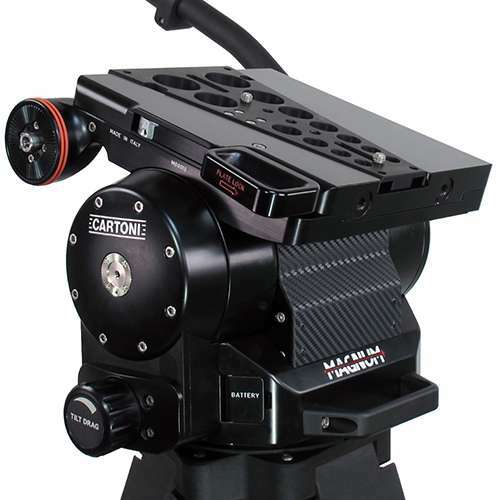 The continuously variable fluid control knobs located on sides of the head have an innovative flip folding design, are easy to reach and are connected to a digital readout which allows the cameraman for a quick set-up even in low light conditions. The effective control brakes on both, pan and tilt mode are located on the front left side of the control panel and can be operated with a single hand. Two threaded holes for the teleprompter tubes are also provided on the front of the sliding platform. The Magnum interfaces directly with any Mitchell flat base Heady Duty Tripod and can be easily mounted on top of all existing Pedestals featuring the 4-hole bores. The camera wedge plate has an ergonomic quick release and a wide range of slide adjustment for micrometric balance setting. Please consider for your next OB Production.